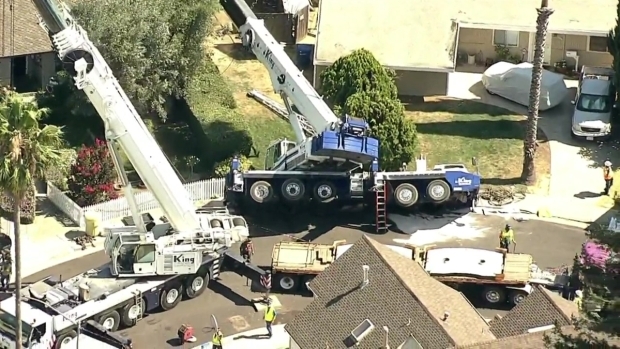 Workers have pulled a massive crane off a Campbell house where it landed on Tuesday afternoon, leaving behind plenty of damage. Crews from King Crane, contracted by PG&E, were replacing a power pole in a Sondra Way backyard when it toppled, landing on a residence's roof and a fence just before noon. The crane is a 2011 Link-Belt registered to Bigge Crane and Rigging Co., according to Department of Motor Vehicle records. No injuries were reported, but PG&E and Cal/OSHA say they will investigate the crane contractor. The crane was extended by an estimated 200 feet when it tipped over. Crews spent more than 12 hours, using two other cranes to upright the one that had collapsed. It was loaded onto a large truck sometime after midnight. A number of people who live in surrounding houses had to be evacuated during that removal process. But the scene was close to being cleared Wednesday afternoon. "Everything's getting back to normal," neighbor Jeff Harrison said. "I feel sorry for the folks across the street; they spent the night at a hotel." Aerial footage of the scene showed substantial damage to at least one home's roof. PG&E initially said two homes were damaged. "It didn’t hit the house, but it was a huge boom crashing noise like I had never heard before," she said. "Before it happened, I wasn't concerned at all because they said, 'We do this all the time.'" PG&E said 26 customers went without power Tuesday afternoon. The power had been shut off before the repair work began, police said. PG&E crews were at the scene Wednesday repairing power lines and working to restore power. The original job of replacing the power pole was completed Wednesday, PG&E said. Police and investigators were uncertain of what caused the crane to topple and said the incident is being investigated. Cal/OSHA officials said Wednesday it could take 3-4 months to sort it all out. King Crane, based in San Jose, did not respond to requests for comment.